I came across a blurb on SF Gate that Treasure Island Flea is having a 2-day Halloween party and food drive. I then realized in almost 30 years living in the Bay Area, I have never really been on Treasure Island other than having to turn around due to driving carelessness. Treasure Island is right off the Bay Bridge which I have driven on thousands of times on my way to and from San Francisco. In more recent years, developers have built houses and apartments on the island. People do actually live there. I thought, this would a a perfect opportunity to check out the island. The weekend event is also dog friendly, so I can take Kelsey without lying about her being a service dog. It turned out that it costs $3 to attend the flea market with free parking. You also have to pay a bridge toll of $5 if you are going from the East Bay. It's toll free if you are going from San Francisco. It's not bad considering it was a nice day to be hanging out on the island. You can see San Francisco and both Bay Bridge and Golden Gate Bridge plus Marin County from Treasure Island. There were also a lot of interesting items in the flee market. I am not into shopping, so I only bought a bag of natural dog treats for Kelsey and a small bag of baked beet chips for myself. I bought them mainly because the vendors were so friendly and kept offering me to try their items. Kelsey of course loves any kind of treats. She was a good dog to be hanging out in front of their booth. I was more interested in the food trucks than anything else they were selling at the flea market. In recent years, due to the economy, many chefs started their own gourmet food truck business instead of opening up restaurants. The over head is a lot lower to operate food business from a truck. The term "roach coach" seems to become more of a thing of the past. The cost of entrées from the gourmet food trucks aren't exactly cheap. A cupcake can cost up to $4. I had my mind set on a Belgian waffle from Golden Waffle. I had the works with fresh strawberries, chocolate syrup, and whipped cream. It was $6 and quite delicious! Kelsey again attracted a lot of attention with her friendliness and backpacks. People didn't seem to understand why a dog needed to carry stuff. Kelsey's got her collapsible water bowl, 2 bottles of water, and treats in her packs. With the warm weather today, Kelsey actually drank most of her water. She took every chance to cool off in the shade. Last month I went to Robert Sibley Volcanic Preserve for a hike and got a little lost while trying to take a shortcut. It ended up to be an almost 6-hour hike. Both Kelsey and I were exhausted when we finally made our way back to the car. Now more than a month has gone by, and I decided to go back and check out other trails. I picked up a few things at Berkeley Bowl and headed over to the hills around 10 a.m.
Today I went toward the opposite side of the preserve. The weather was perfect for a hike since there was very little shade on these trails. Kelsey and I entered the cattle grazing area. We did not see any cattle, only cow pies. There were huge piles of cow pies at the end of the trail on the other side of the second cattle gate. The open space was as far as the eyes could see. I didn't know how far it would go. Base on last month's experience, we just turned back at some point. What I did see was a gopher snake. At first I wasn't sure whether it was alive because it was motionless. Kelsey almost stepped on it but I called her to the other side. As I got closer to the snake, it moved forward a little. We encountered many kids on the way back. They were all very excited at seeing a dog with backpacks. One said that Kelsey was wearing "a purse". It was a great hike under the blue sky with many friendly dogs on the trail. I think we will go back there soon. For second year in a row I volunteered for Meals for Wheels of San Francisco at one of its annual fundraising events, Fallfest. Over the years I have volunteered for countless non-profit organizations and for various social causes. If you love food, Fallfest has to be the best volunteer event in the area. It is "a celebration of the Bay Area’s best in food and wine. Leading restaurateurs, winemakers, mixologists, and epicurean artisans join together for an inspiring day of premier wine and food tasting, chef demonstrations, cocktail competitions, and panel discussions. It all takes place outdoors at Justin Herman Plaza, which is transformed for the day into a European-style marketplace, taking full advantage of the season’s gorgeous weather and the waterfront’s beautiful views." My shift at the Silent Auction tent started at 2:30 until 5 p.m. I arrived at the event around 1p.m. to enjoy the food sampling as a guest. Not all volunteer organizers are as generous as Fallfest. I have volunteered for other culinary events that absolutely wouldn't allow volunteers to taste any food at the events even as the events were closing down. In addition to tasting countless amazing samplers, I also won an one-hour docent led tour at the Marin Mammal Center by playing their Spinning the Wheel! At the Silent Auction tent, I immediately recognized a few patrons from last year. Once again, they were generously bidding on various items that benefited Meals for Wheels. The auction ended at 3 p.m. We quickly gathered all the auction items and lists to compile the list of bidding winners. We had 30 minutes to put all the winners' names on the charts for them to claim their items and pay. I was assigned to guard and pull out the winning gift certificates as the winners came forward. It was fun to interact with some of San Francisco's nicest people. I shall be back next fall! One of my neighbors brought home 3 chicks recently. Since they are just babies, they stay inside in a homemade cage right now. They are super cute, and they make the cutest noise. I love holding the chick in my hands against my chest. It's so soft and warm. I hope the neighbor is keeping them for eggs only. I wonder how Dusty and the chicks would react to each other. I have seen many homestead farms that keep rabbits and chickens in the same coop. They tend to get along well and keep each other company. I promised Kelsey that I'd take her somewhere for a day trip during my week off from work. I have been flipping through The Dog Lover's Companion to the San Francisco Bay Area to see where would be fun to take her for a day excursion. I found out that well behaved dogs are allowed on Blue & Gold Ferry but not from Oakland and Vallejo. My options were either Tiburon or Sausalito. I have taken the ferry from Tiburon several time in the past, so I decided to go to Sausalito. The book also highly recommends Remington Dog Park, which is just down the street from Sausalito Ferry Station. I stopped by the park first. It's a big fenced park that allows dogs to roam freely. The ground is mostly covered with thick mulch. It's well kept with plenty of shady areas and picnic tables although food is not allowed in the park. It's a great park for dogs who like to play together and their people to socialize. Kelsey on the other hand just sniffed a few dogs and walked around, and she was done. I drove down to Downtown Sausalito where the ferry dock is. The first parking lot adjacent to the ferry station costs $3 an hour to park. If you go down to the next further parking lot down the street, it's $2 an hour. If you go even further to parking lot 4, it's $1 an hour. All of these parking lots are on the same side of the street next to the water. Basically, the further you are willing to walk, the cheaper it gets. I circled around a couple times before figuring this out and ended up parking in lot 4. It's still just 5 minutes walking down to the ferry dock. When I arrived the dock, I was so excited, I just purchased my round trip ticket to San Francisco through the vending machine and then I realized that I had made a mistake. I have bought a ticket for Golden Gate Ferry not Blue & Gold! I started to panic. What if they wouldn't let me take Kelsey on board? I just spent $20 on the ticket! I walked over to the information booth to find out what the animal policy is for Golden Gate Ferry. The man in the booth looked at Kelsey and asked, "Is she a service dog?" I told him that she could be with hesitation. The man said, "Of course she is. She's wearing a backpack." And of course Kelsey was sitting next to me in the most perfect pose. The man pointed to the deckhand who just got off from the ferry and told me to go ask her if service dogs are okay. Well, I knew that service dogs can pretty much go anywhere and no proof is ever needed. So not only I got on board, I was the first person to go on board with my "service dog." In fact she was wearing a backpack to serve me. Kelsey just quietly sat next to me during the entire time on the ferry. Occasionally she'd look up and perk up her ears at loud noises. Several people and kids came and petted Kelsey with admiration. Many people simply greeted Kelsey with a smile. I guess she looked like she was working hard. We took a walk around the ferry building before getting on the ferry again to return to Sausalito. Well, I guess if I ever wanted to take Kelsey on BART, I just need to dress her in her backpack and harness. Today was the first day of my week-long fall recess from my new full time job at a school. I wanted to do a little gardening while having the time off. I got a pleasant surprise when I looked into one of the wine barrel planters. There is a small butternut squash! I didn't even intentionally plant butternut squash. The seed must had been mixed in with the pumpkin seeds or my compost. I am pretty excited because it's something new on my farm, and I actually like butternut squash. I usually make a big pot of butternut squash soup during the winter when it's cold and rainy. I also found another squash in one of the vegetable beds. I am not sure what kind of squash it is. One of my neighbors gave me a bag of mixed pumpkin seeds, and I just randomly planted a few. This morning I woke right before 8 am. I got up, packed up, and headed over to Golden Gate Park with Kelsey in the back seat. Do you know there is free parking in Golden Gate Park? It's limited to 4 hours during Monday through Friday. On Saturday and Sunday, it is unlimited, but you must get there early. I got to the park at 9 am, and there was plenty of parking. As I was parking, I could see one car after another pulling up and parked behind me. I was pretty sure by 9:30 it would be hard to find parking. I can see why people love the city. Every weekend and every day there is so much going on. One can never and should never be bored in this area. Many of the weekend activities are free, and if you don't mind taking a little time to plan and pack your own food and drink, you don't need to spend any money at these events. This weekend was the annual Hardly Strictly Bluegrass Festival. It always runs for 3 days starting from Friday to Sunday. People come from all over the Bay Area to enjoy this free music festival. It is also SF Fleet Week. I am not sure whether that's free, but I am sure if you know where to go, you can see the air show for free by looking up the sky. 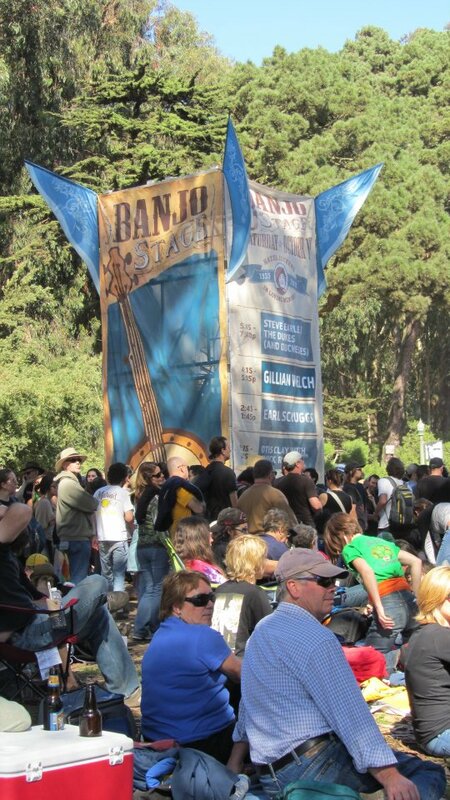 Today there were 6 stages on one side of the park for Hardly Strictly Bluegrass. On the other side, just across from De Young Museum, The Golden Gate Park Band was having their last free performance of the season. After I checked out several stages of Bluegrass Festival, I sat on one of the green benches in the shade to enjoy a different kind of music. Kelsey seemed to be pooped after hours of walking, loud music, and being surrounded by people. She just laid down to take a nap. Today I finally picked some perfectly ripe Cape gooseberries! It took them almost 2 months to be ready. The bright orange color is very Halloweenish! They definitely look like an autumn fruit. One of the reasons I fell in love with them right away besides their taste is that I always feel like opening a little present when I break the papery calyx to get to the berry. It's such a fun fruit to eat. I have 4 Cape gooseberry plants but so far the one in the pot has most berries. Since Cape gooseberry is native to tropical Peru, Columbia and Ecuador and related to tomatoes, I figured it must like heat and lots of sun. I was able to move the potted Gooseberry around to get most sun. In the winter I can bring it into the sun room if the temperature gets too low. I hope they all survive the winter and produce more berries next year.